Breathing is supposed to be easy. However, for the more than 11 million people who have been diagnosed with chronic obstructive pulmonary disease and estimated millions more who may be undiagnosed, breathing can be a challenge. These are the statistics provided by the American Lung Association. The COPD Foundation estimates a total of around 30 million Americans suffer from this chronic lower respiratory disease. In fact, COPD is the third leading cause of death in the United States. There is no cure for it, but there are treatments, and recognizing this disease and getting help early can make a huge difference and allow a better and longer quality of life. COPD is when a person’s respiratory system is chronically compromised. That could be because of lung damage, excess mucus or loss of elasticity/inflammation in the airways. As a result of the damage, oxygen cannot flow as well through the lungs, air sacs and airways, and the lungs cannot expel as much carbon dioxide when a person exhales. It is also a progressive disease, which means that it gets worse over time, especially without treatment. COPD is most marked by shortness of breath and frequent coughing or wheezing. But there are other symptoms too, including tiredness, tightness in the chest, frequent respiratory infections (such as pneumonia) and blueness of fingernail beds or lips. If you or a loved one experiences these telltale signs of COPD, seek help from a doctor. In addition to these symptoms, COPD also signals a higher risk of lung cancer, heart attacks and strokes. How can I manage my COPD? There are two important principles in managing COPD. The first is to address your lungs and respiratory system, and the second is to address your general health because illness can exacerbate COPD. The best thing you can do for your COPD is to stay away from smoke. Eighty-five to 90 percent of COPD patients are or have been smokers, according to the American Lung Association. If you do smoke, find a support group or program to help you break the addiction. Local resources include Erlanger Health System’s smoking cessation courses on Thursdays at 5:30 p.m., as well as the Tennessee Tobacco Quitline, 1-800-QUIT-NOW, and some churches and other community organizations also offer assistance. When you are diagnosed with COPD, your doctor will most likely prescribe controller inhaler medications and rescue medications. Use these as prescribed since they can help you keep your lungs more clear of mucus. Believe it or not, exercise can also help you with your lungs. The COPD Foundation recommends exercising at least three days a week. According to the American Lung Association, “Exercise helps your blood circulate and helps your heart send oxygen to your body. It also strengthens your respiratory muscles.” Start out slow so that you don’t overdo it, and use oxygen as you exercise if your physician has put you on oxygen, but as you exercise more, your body should be able to do more over time. Walking, swimming and bicycling are often good choices, and adding some easy resistance training, such as light weights, can help your breathing muscles stay strong. Drink plenty of water. Water helps keep your airways clear by loosening mucus. Drinking eight glasses a day is recommended. Practice good breathing techniques. Breathing from your belly instead of your chest is one approach to help you improve your breathing muscle, the diaphragm. Another strategy is purse-lip breathing, which improves your ability to take in oxygen and exhale carbon dioxide. Breathe in for two seconds through your nose, then breathe out for four seconds through pursed lips (as if you were blowing out birthday candles, but with less force). Even what you eat can make a difference. Simple carbohydrates, like sugar and refined products, produce more carbon dioxide, which your body has a harder time getting rid of with COPD. Choose more fruits, vegetables and whole grains. Consider eating smaller and more frequent meals to avoid bloating, which can make breathing harder. 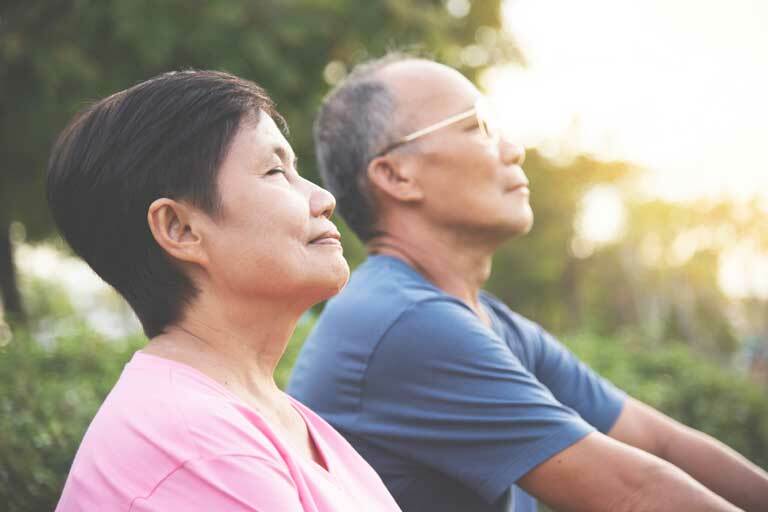 Taking care of your general health is just as important as caring for your lungs, and even more important for those with COPD than for the general population. With a compromised respiratory system, your body has to fight illness harder than normal. Get your flu shot. The flu sends a lot of COPD patients to the hospital each year with exacerbations of the disease. Many pharmacies offer free shots each year. Get your pneumonia shot. Again, COPD patients are more likely to develop pneumonia because their lungs cannot get rid of bacteria as easily as they should. Add an extra layer of protection between yourself and the ER. Practice good hand-washing hygiene. Wash your hands with soap and water for 20 seconds before eating, and avoid touching your face whenever possible. Keep hand sanitizer with you when you go out in public, where all sorts of germs can lurk. Stay away from large crowds or people who you know to be sick, especially during flu season. Ask family and friends not to visit you when they are sick so that you can stay healthy. Get enough sleep. Staying well rested is good for your immune system, which can help ward off a flare-up. While COPD is a serious condition, you can take steps to manage it effectively and continue to live a happy life. Always consult your doctor before starting any new treatment, exercise program or diet. A health care professional will be able to help you properly decide what kind of treatment will be most beneficial for your individual needs.